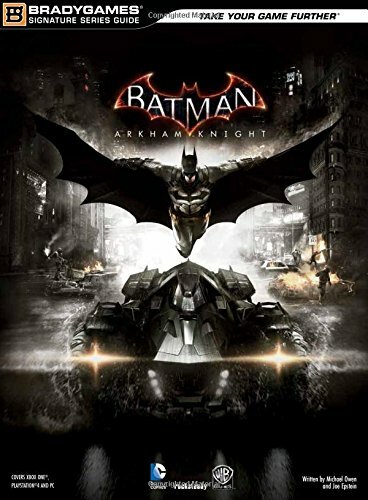 The Batman: Arkham Knight Signature Series Guide includes: BE THE BATMAN - This Signature Series guide gives you everything you need to defeat the united villains of Gotham City in the epic conclusion to the acclaimed Batman: Arkham series.Comprehensive Walkthrough - Over 300 pages of game-tested strategies lead you step-by-step through the entire experience from start to finish—take down every villain!Highly Detailed Area Maps - Our comprehensive maps let you find your way through Gotham City with ease! Pinpoint critical locations, people, and items in every area.Side Missions - Gotham City never sleeps and there’s always work to be done for a hero. Discover and unlock each and every side mission the city has to offer.Augmented Reality Challenges - Face and defeat every AR Challenge, spanning all the skills and gadgets in your arsenal!FREE Mobile-Friendly eGuide - Unlock the eGuide, optimized for a second screen experience.